The stage before the runway may be an interesting get-together of fashion-lovers, snobs, media-worthy mentions, fashion victims, bloggers, buyers, designers, admirers and various other, pretentious or otherwise, individuals caught up in their “how do you do” ritual. The scene backstage, however, is anything but relaxed - well, depending on who the camera is capturing. The models with a fair degree of relaxation in their behaviour (or at least that’s how they appeared to be whilst capturing Pokemon). On the other hand, the designers, balls of tension and stress, scurrying about amidst the raised voices of the backstage staff shouting “Okay boys, get naked!” and “make-up check!” You can clearly see this transition from joviality to outright intense concentration. Being a newcomer to this world I found it to be an interesting contrast between relaxed invitees and intense designers. It is no different to a 5 star restaurant where the dining room is all posh and dainty while the kitchen is literally ablaze getting the dish ready to be served. Assistants and volunteers rush to eliminate wrinkles from the face of the fabric (and the designers that worry about them so); make-up artists beautify faces (or in Moto Guo’s case, creating acne rather than covering them up); models get into their zone and ready to strut their stuff; backstage operators run through the walk plan and rush models to the catwalk (in what I can only describe as a an American Football scene with coaches going through the game plan); and, fashion designers giving the final “ok” before the models hit the runway. 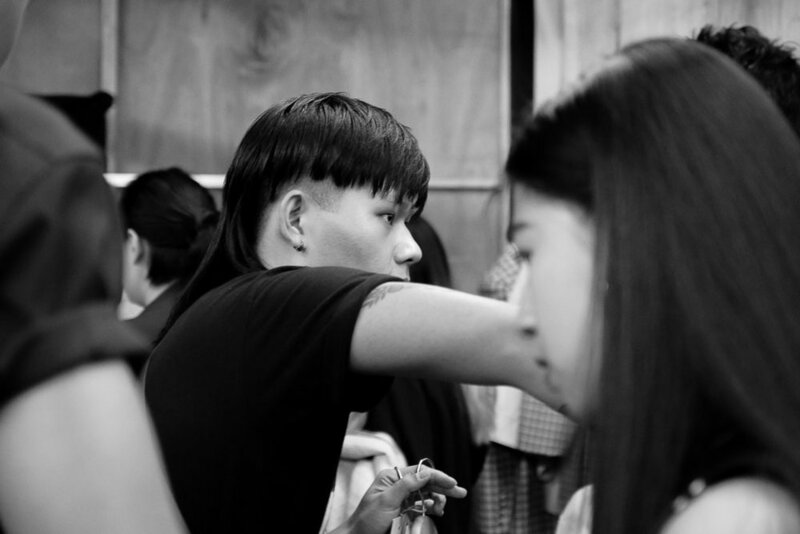 KLFW Backstage Tip#1: Take A Cold Shower Before Going Backstage! You will see good looking people back there. Just a heads up. KLFW Backstage Tip#2: Get Close & Personal! Don't be afraid to really get in there. It's chaotic but that shouldn't deter you from getting that money shot! KLFW Backstage Tip #3: Get Real! The brilliant thing about being backstage is that you get to see the realness of the whole event. Capture the models, assistants and designers in their "natural habitat." Make no mistake - the backstage is not the prim, proper and posh stage of a runway. People are busy ironing, putting on make-up and darting about! Be sure to get out of their way! KLFW Backstage Tip#5: Have Fun! Keep it lighthearted - it's intense back there! Besides, you're backstage~ Enjoy the VVIP feel. Special thanks to Moto Guo for inviting Around The Block and myself over to Kuala Lumpur Fashion Week Ready To Wear 2016 and backstage. The womenswear featured here is a part of Innai Red's SS17 Collection.